Want to have a fresh music experience on your Samsung Galaxy Tab 10.1 device? Download and install the Slacker app and tune in to Slacker Radio for millions of songs and thousands of artists right from your device. Slacker Radio is an all-inclusive music application available in the Google Play Store for free. Following are the methods on how to set up slacker on your Samsung Galaxy Tab 10.1. You may refer to this guide in case you need further assistance in doing so. 1. Get to the Home screen and tap on Play Store. If you don't have the Play Store shortcut from Home, tap on Apps and then tap Play Store. 2. Look for the Search icon and tap on it. For you to access Google Play Store, a Google account is required. In case you have not Google account set up on the device, simply follow the prompts to guide you through setting up an account on your mobile device. 3. If prompted, read the Google Play Terms of Service and Terms and then tap on Accept to proceed. 4. Enter or type the word "Slacker" in the search field and then tap Search to initiate search for Slacker on Play Store. 5. Tap to select Slacker Radio from the search results. 6. Tap Install or Download to initiate download and installation process. 7. Carefully read the permissions and then tap Accept & Download. 8. The Slacker app is now installed on your device. Tap Open to run or launch the app. You can also open the Slacker app from the home screen. Simply tap on Apps and then tap Slacker to launch the app. 9. Read the Notice prompt and then tap OK to continue. 10. Enter the Email address and Password you used for the Slacker Radio account and then tap Sign in. To create a new Slacker Radio account, just tap Create Account and follow the on-screen prompts to complete the process. 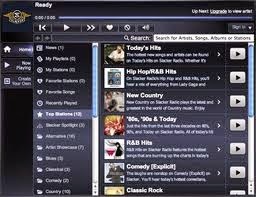 You now have successfully set up the Slacker Radio account on your Samsung Galaxy Tab 10.1. You may now begin tuning into the Slacker Radio and listen to your favorite songs from your favorite artists.